Exceedingly scarce first edition of Johnson's southwest map. Johnson's California Territories of New Mexico and Utah. The scarcest and most historically significant of A. J. Johnson's southwest series. 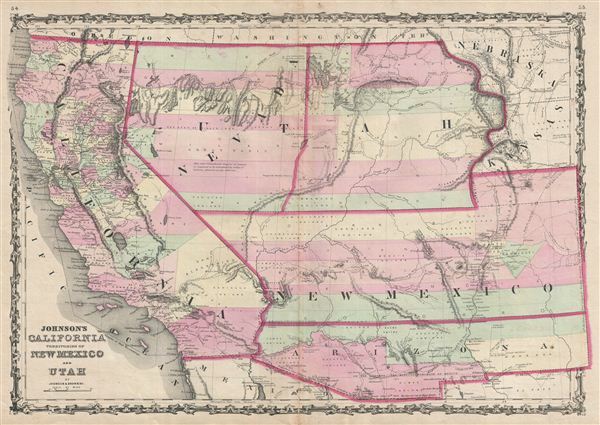 This is the 1860 first edition of A. J. Johnson and Ross C. Browning's map of California, Utah, Nevada, New Mexico, and Arizona. The map covers from the 42nd parallel south to the Mexico border and from the Pacific to modern day Colorado. Though later editions of the Johnson atlas are common, the 1860 edition, which was Johnson's first, had the smallest print run of the entire series and for all intent and purposes, unobtainable. Unlike most maps in the 1860 Johnson atlas, this map was a unique production and therefore not based upon the earlier atlas maps of J. H. Colton. Rather, it seems that Johnson derived this map by dissecting the plates of his 1859 wall map of North America and then incorporating, oftentimes superimposing, more contemporary detail. Such is the case in the Nevada – Utah territory, where both territories are labeled Utah, despite being split in half along longitude 113 and the miss-mapped Sevier / Santa Clara River. Johnson revised this curious border to strictly adhere longitude 116 in the subsequent 1861 edition of this map. eastern Utah here extends well into modern day Colorado incorporating Middle Park, but not North Park and South Park, within its borders. The Colorado Gold Region, which was first discovered in 1858, is well labeled. Subsequent editions of this map, published in 1861 shortly after the incorporation of Colorado, revise this border to include the territory. Fillmore City is identified as the capital of Utah and a Mormon Settlement is noted along the Nevada – California border. Of even greater interest in Johnson's curious treatment of New Mexico and Arizona. Here the region is divided along the 34th parallel, with Arizona occupying the southern part of New Mexico. This configuration first appeared in wall maps of the United States and North America issued by Johnson and Colton in 1859. We have been able to discover no clear cause for this division, for it aligns neither with the Gadsden Purchase and presages the events of the Civil War. In 1860, when Johnson drew this map, New Mexico was a recognized territory, but Arizona was not. It could well be that Johnson and Colton were responding to appeals to congress by the residents of southern Arizona for recognition as a territory. With only a small population and minimal political influence this region was largely ignored by the New Mexico territorial government in distant Santa Fe. Though Arizona applied several times to be granted independent territorial status, its low population caused the request to be repeatedly denied. The latitudinal border between New Mexico and Arizona was subsequently removed in the 1861 edition. Remarkably, both Johnson and Colton proved remarkably prescient in setting this borderline, for little did they know that in 1861 the Confederate Col. John Robert Baylor would invade southern New Mexico and declare himself governor of the Confederate State of Arizona, which briefly reappears in the 1862 and 1863 Civil War editions of this map. California, which enjoyed a population boost in the prior decade due to the 1849 Gold Rush, is naturally quite detailed with numerous towns, cities, mail routes, emigrant roads, and shipping lanes identified. This map also includes the routes of several exploratory missions commissioned by the U.S. Government, including Fremont, the Mexican Border Survey, Parke, Gunnison (along with the site of his tragic death), and Fredonyer. It is further noteworthy that this example of Johnson's map is in pristine condition – a rarity for any early edition of Johnson's southwest and a special bonus in this supremely uncommon first edition. This map was published by A. J. Johnson and Ross Browning as plate nos. 54-55 in the 1860 edition of Johnson's New Illustrated (Steel Plate) Family Atlas. Rumsey has an example of this map in which the plate nos. are set at 47-48, further commenting that there was a later issue of the atlas published in the same year. This map is identical to the Rumsey example with the exception of the page numbers, leading us to believe it must have come from the 2nd 1860 issue of the first edition. Johnson, A. J., Johnson's New Illustrated (Steel Plate) Family Atlas, With Descriptions, Geographical, Statistical, And Historical. , 1860 (Johnson and Browning), 1st edition. Johnson's New Illustrated Family Atlas was produced in numerous editions from about 1860 to 1887. Johnson's first atlas was mostly likely the 1859 edition of Colton's General Atlas which both aesthetically and comprehensively very similar to the 1860 first edition of the New Illustrated Family Atlas. Johnson's atlas was noteworthy in its day as one of the few commercially produced American atlases that could compete with more established European Atlases. Although he called the atlas 'Steel Plate' on the title page for marketing purposes, Johnson in fact incorporated modern lithographic printing techniques and lower quality woven wood pulp paper to economically produce large format maps in quantity. He also began publishing the New Illustrated Family Atlas on the cusp of the American Civil War, a decision that proved fortuitous, as the war corresponded to a general increased interested in cartography. For the most part, Johnson's Atlas was sold by subscription; nonetheless it became so popular that for at time he was considered the largest publisher in the world. Other than the first edition, the atlas itself has no true editions. Rather, Johnson incorporated updated maps as they became available, so each example of the Johnson atlas might well contain unexpected and scarce individual maps. Johnson's map of the American Southwest, for example, appeared in more than 17 different states, each illustrating minor variations to the rapidly chasing geography of that region. Moreover, Johnson's offered a service whereby he would mail updated map pages that could be tipped into older atlases to keep them current. Generally speaking, Johnson's atlas was issued in four periods - each defined by a distinctive decorative border. The earliest edition featured a strapwork border that appears as rolled and decoratively cut leather. This borderwork remained in use until 1863. In 1864 Johnson started using an updated fretwork or grillwork border that resembles worked iron - as in a decorative fence. This border was in use from 1863 to 1869. The 1863 edition of Johnson's atlas used both borders and is considered transitional. From 1870 to 1882, Johnson introduced a new border that featured elaborate Spirograph style geometric designs, which was used from 1870 to 1882. After 1880 a new border different but aesthetically similar to the Spirograph border began appearing. Certain editions of the atlas issued from 1880 - 1882 were transitional. Very good. Original centerfold. Even overall toning. Blank on verso. Rumsey 2905.031 (1860 edition). University of Nevada, Reno, Special Collections, G4300 1862 J646. Wheat, C. I., Mapping of the Transmississippi West, 1540-1861 (5 vols), #1027.